But, when they are wearing them, they are extra beautiful! All that velvet and heavy satin and the long gloves….so pretty! They were wearing them during the Festival of Fantasy parade for several days last week before Christmas (Dec 2016). 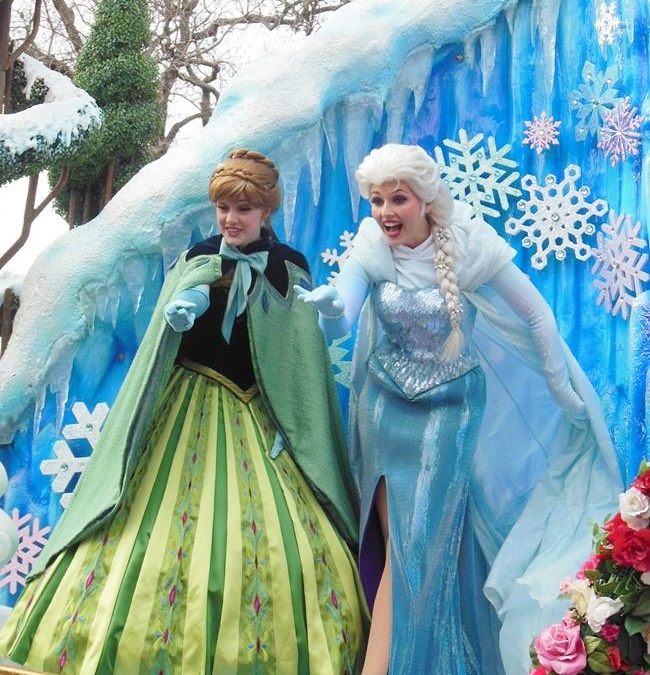 The Frozen princesses dressed to stay warm. The Frozen princesses in their capes and gloves. 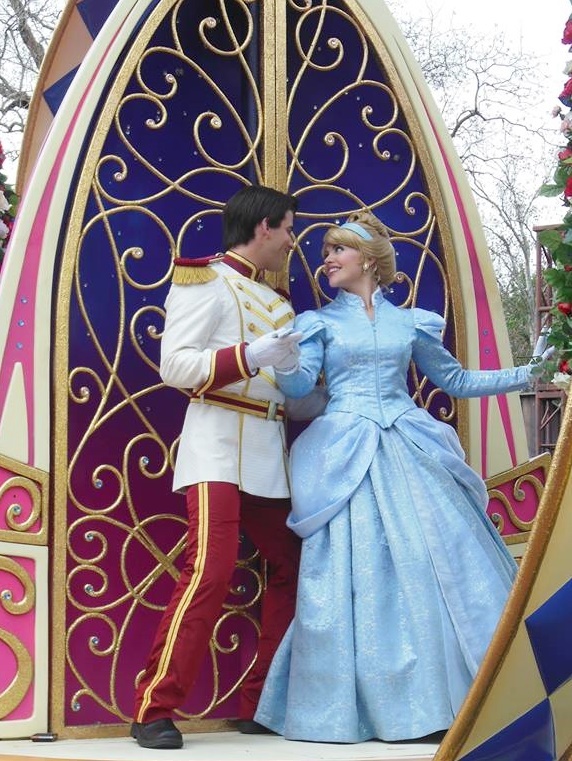 So exciting to see Cinderella in her winter outfit! 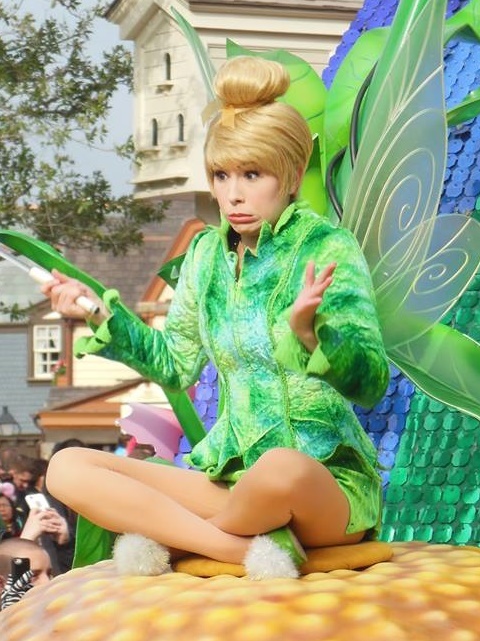 We didn’t even know that Tinkerbell had a green jacket for her costume! 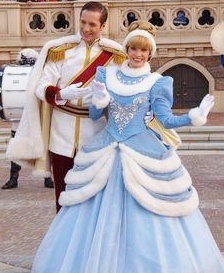 They also wear their winter costumes for the character meet and greets in the parks when the temps fall below 60 degrees. 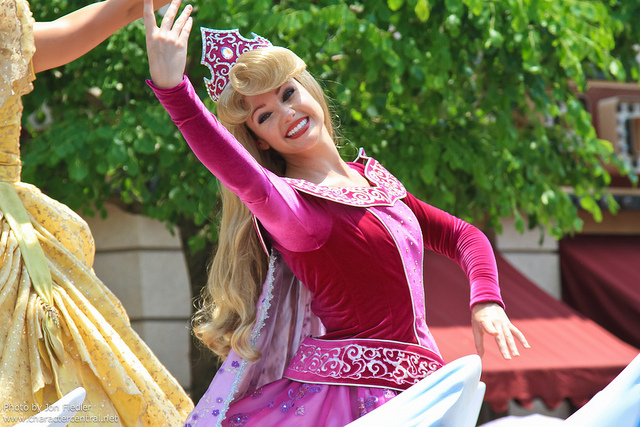 Princess Aurora in her long-sleeved gown. Snow White in her winter gown. 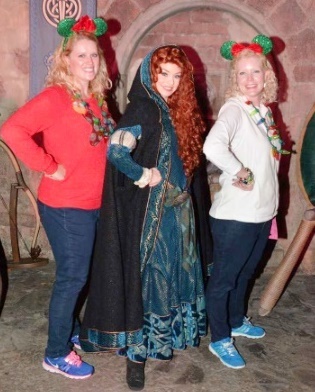 Merida wearing her long winter cape. Tiana looking warm in her winter gown and cape. 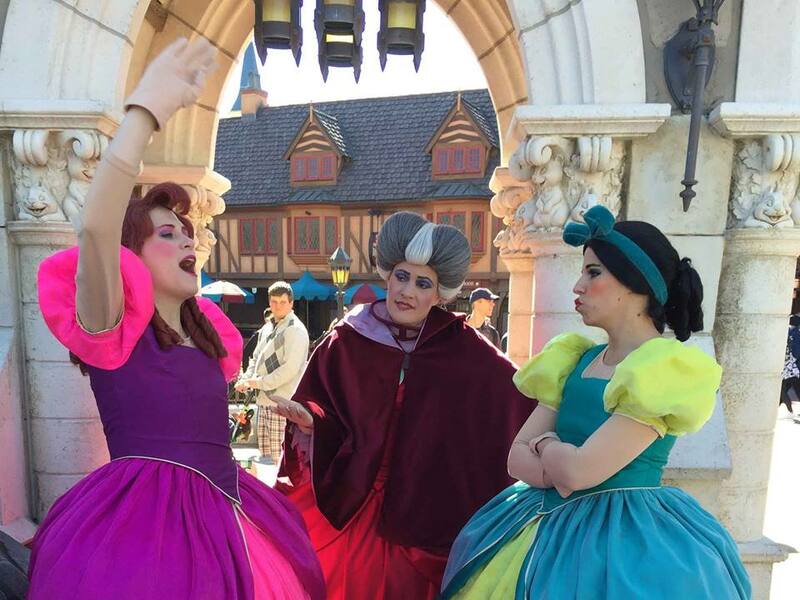 Cinderella’s mean stepsisters & stepmother in their winter outfits. 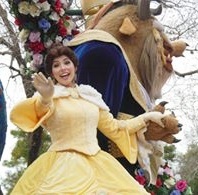 Full on view of Belle’s winter dress. Lovely! And here is the rarest of all the winter costumes….TARZAN! 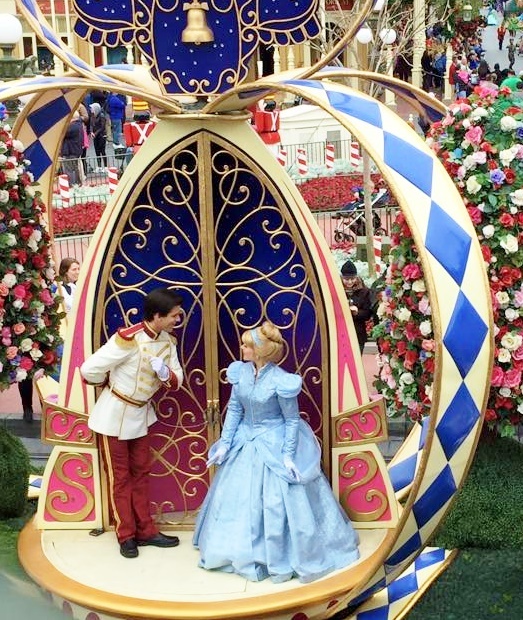 Meanwhile at Disneyland, they hold Christmas Fantasy Parades during the holidays with special princess costumes and tiaras. Princess Aurora looking lovely in the tiara. 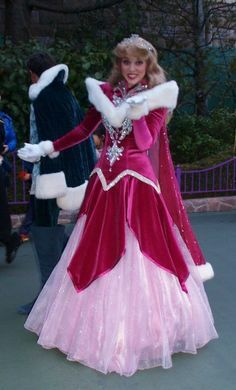 Another winter gown for Princess Aurora. Epcot Germany – A beautiful town square with a real clock tower. The Germany pavilion is one of our favorite places to shop at Epcot! We’ve bought some crystal figurines there and we can’t talk about Germany without talking about the wonderful caramel popcorn at the Karamell Kuche shop!!! At the Karamell Kuche shop….so delicious!!!! And, Snow White meets there every afternoon by her wishing well. 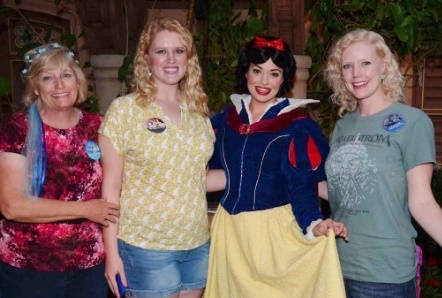 Meeting Snow White at her wishing well. 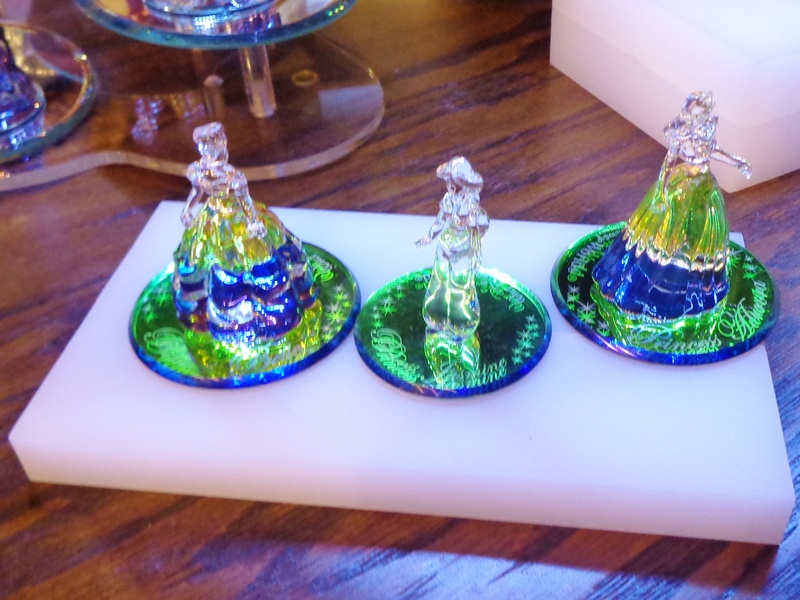 Something fun to buy at Epcot for the holidays is a Christmas Pickle! Christmas Pickle Backstory: In the early 1890s, Woolworth department stores started selling glass ornaments imported from Germany that were in the shape of various fruits and vegetables, including a pickle. Around the same time it was claimed that the Christmas Pickle was a “very old German tradition” and that the pickle was the last ornament hung on the tree on Christmas Eve, buried deep in the tree’s branches. A whole Christmas tree of Christmas Pickles at the shop! The first child to find it on Christmas morning is rewarded with one of three things: the privilege of opening the first gift, or receiving an extra gift from Santa, or being granted a year of good luck. We are friends with an ICP from Germany who worked at Epcot’s Germany pavilion last year and he said that he never heard of the ‘Christmas Pickle’ before coming to America, and neither did any of his coworkers! Bottom line, the Christmas pickle is actually an American Christmas tradition, not German! But, we still like the idea of getting an extra present on Christmas morning! Read more about our visit to Epcot Germany here: Epcot Germany Pavilion. Selling gingerbread treats since 1999! This time of year when you walk into Disney’s Grand Floridian Resort, you can immediately smell the sweet and spicy aroma of baked gingerbread. Buying some sweet treats at the Gingerbread House. Right beyond the huge and beautifully decorated Christmas tree in the middle of the grand lobby sits the 2016 Grand Floridian Gingerbread House. The gingerbread recipe for making 5,089 shingles! The Gingerbread Shoppe is open 10am – 10pm daily until January 1, 2017. But, the best part of the Grand Floridian Gingerbread House is that on the backside of the structure, you’ll find the Gingerbread Shoppe, a dutch window where guests can purchase many kinds of sweet treats. The gingerbread shingles are the BEST! The cookie is very soft with a subtle gingerbread taste. And, the best part is that the back of the shingle is covered in rich dark chocolate, which pairs nicely with the gingerbread flavor. 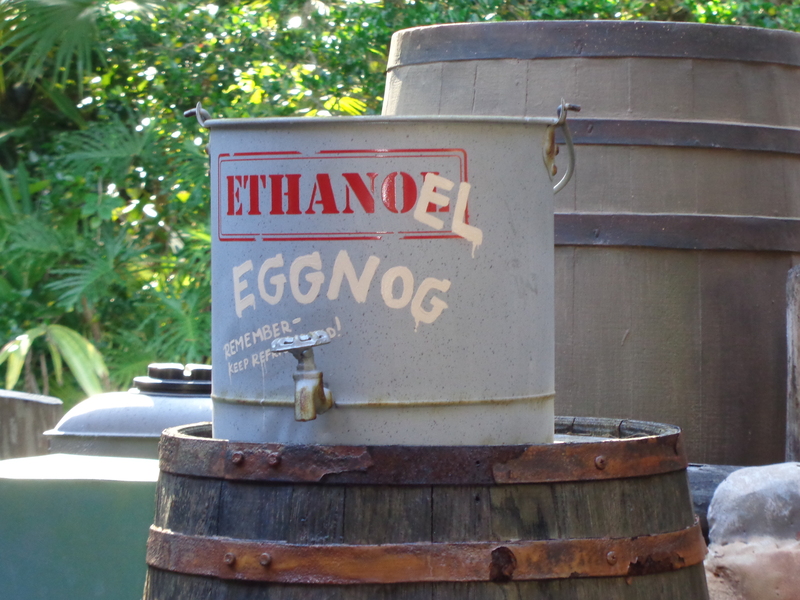 It is one of our favorite treats at WDW. You can even buy decorated gingerbread houses at the GF Gingerbread House! The front side of the Gingerbread House. I found one of the Hidden Mickeys in the shingles! The Gingerbread Shoppe is open from 10:00 a.m. until 10:00 p.m. daily during the holiday season, usually until the first week in January. This year, the Gingerbread House Shoppe is scheduled to close January 1, 2017, and Disney will start to disassemble it January 4, 2017. Interested in what happens to all that gingerbread??? It gets recycled and composted! Disney Bees Recycle GF Gingerbread House! Special resort pins are available during the holiday season. We got to see it – and buy some sweet treats – last year. So pretty…so yummy!! The 2016 Grand Floridian holiday pin. The perks of being a DCP cast member are pretty good for a paid ($10/hr. – 12.75/hr. for most CPs in 2019) internship program. They can save you thousands of dollars while you are working at Disney. 1. On your first day working for Disney, you will take the Disney Traditions class. Afterwards, you’ll get your Company ID. 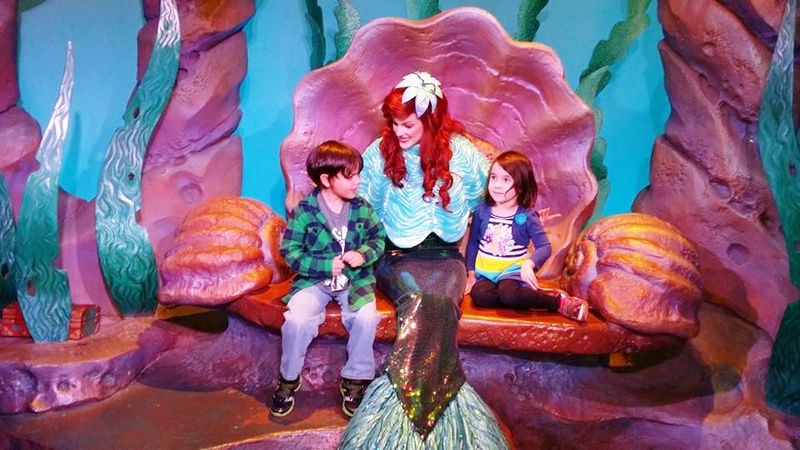 Your Disney ID allows you unlimited entrance to all US Disney theme parks in Florida and California. Note: There are some Blackout Dates dates throughout the year, mainly effecting the Magic Kingdom guest passes. As those times are when the Parks are at peak capacity, you don’t want to go then anyway. Why go to a Park when it’s mobbed with people when you can enjoy the Parks anytime? 2. After working 150 hours, you’ll be mailed the first set of 3 One Day Park Hopper Disney Guest Passes to use to get friends and family into the Parks for free! Every 150 hours, you’ll be mailed another set of passes (up to 9 free passes per calendar year). You’ll also have opportunities to receive additional free passes through volunteering with Disney VoluntEARS and at other company events. 3. Your company ID gets you a company discount of 20% off all merchandise. During the Disney Family Holiday Celebration period (Oct. 2018 – Feb. 2019), the CP cast member merchandise discount goes up to 40% off! The discount is good at all Parks, Disney hotels, Disney Stores, Disney online, on Disney cruise ships, and at Disney Ports. 4. At many Disney table service restaurants, you can get 20% off your meal. 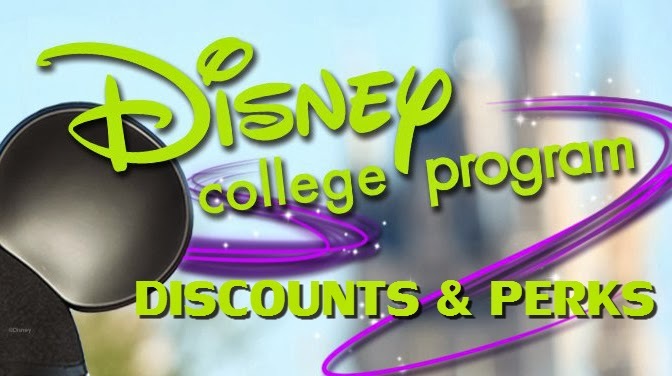 At some restaurants, it’s a 40% discount – Disney Disney Discounts for Cast Members 2019! The catch is that it’s hard to remember exactly which restaurants are currently giving the CM discount and sometimes, even if a restaurant gives the discount, they may only honor it at non-peak hours, i.e., dinner after 9pm. Again, the only way to know is to always ASK! 5. Cast members get to shop at Disney’s private Cast Connection where overstocked or slightly damaged clothing and merchandise is sold for 50-75% off retail, plus then you can use your 10-20% cast member discount on top of that. 6. If you need extra Park passes for visiting family and friends, CMs can purchase discounted tickets (10% off) for them at the Company D Store. The first ten days of the month, the Company D store also does pin trading, limited to 2 pin trades per day per cast member. They usually have several unusual or unique pins on their pin board. Always worth a look! 7. CPs also can get 30% off discounted tickets to the big seasonal event parties like 2018 Mickey’s Not So Scary Halloween Party and the 2018 Mickey’s Very Merry Christmas Party. 8. Your company ID gives you free entrance to both Disney Water Parks, Typhoon Lagoon and Blizzard Beach, on most days of the year! And, you get Free Parking at any Disney Park and the two water parks, currently $22/day at Disney World. 9. If you work during the Fall internship, you’ll be mailed a Disney Family Holiday Celebration 2018-2019 coupon booklet filled with 60% off coupons for Disney hotel stays, 50% off Disney table service dining, free holiday ornament coupon, and 6 free soda coupons and free popcorn coupons. If you take advantage of all of these coupons, especially if you have family members visiting you during your program, you could save thousands of dollars. 10. DCP Housing is a bargain. Let me repeat that: It is a bargain! For about $100/week, taken directly out of your paycheck, you will get a fully furnished apartment with all utilities (A/C, heat, water, very slow wifi internet, cable, phone, sewer and trash/recycling) included. Washer/dryers are in your apartment or onsite. You won’t have to pay any deposits to turn on the electricity, etc. like you would renting a regular apartment. At Disney World, free bus transportation to and from work is also included, all hours of the day and night. All apartment complexes have 24 hour gated security and roaming security guards (important if you’re getting off a 2am shift or going to a 6am shift!) All apartment complexes also have a large pool, and some have hot tubs, tennis courts, basketball courts, and other recreational opportunities like billiards. 11. Disney CP housing hosts monthly Housing Events themed character parties with free food, great DJs, and character meet & greets. They are a blast! Go to all of them!!! 12. Many local area businesses give cast members discounts of 10% off just by showing your Disney ID! Both our favorite Chinese restaurant and our nail salon gave us 10% off our bills. Many businesses advertise the CM discount on their doors or menus, but, if not, ASK! You might be surprised at how many businesses say yes. 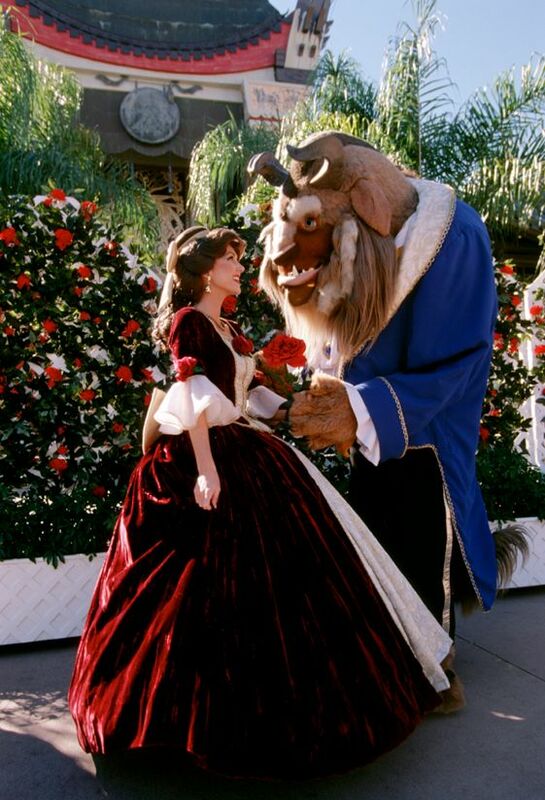 If you chose not to stay in Disney housing, many nearby apartment complexes offer 10% rent discounts to cast members. If you’re not sure, ASK! 14. Here’s the full list of cast member discounts at Disney Springs: CM Discounts at Disney Springs. 15. The AMC Theater at Disney Springs gives CMs a 10% discount on movie tickets and the Starbucks at Disney Springs gives a 10% discount to cast members. 16. You’ll be invited to private, after hours cast member only parties at the Parks, with unlimited rides with no lines and free food! So much fun!!! You can also sign up for Behind-the-Magic Backstage Tours of your favorite rides! 17. You get into the private Disney club for cast members and their families, Mickey’s Retreat, right across from the housing complexes for free! 18. 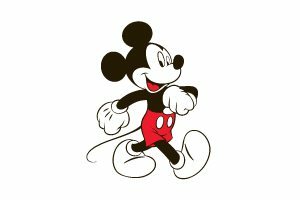 If you’re into Costumes, which is what Disney calls their work uniforms, each work location has a different costume to wear! They are free and Disney cleans them for free too! How cool is that!??!! 19. Fireworks, fireworks, fireworks! If you like fireworks shows, then come work at Disney World where’s there’s at least 3 fireworks shows nightly!! There’s Happily Ever After at the Magic Kingdom, IllumiNations at Epcot, and Star Wars at Disney’s Hollywood Studios. Every night, and sometimes 2x a night! 20. Free stroller rental (single or double!) at all the parks. Just show your ID. Bonus Perk: And, finally, something that we think is a pretty good perk: flexible scheduling with the ability to request time off or trade your shifts if you would like to see what working at another WDW location is like. We worked merchandising at Downtown Disney/Disney Springs (Elly) and Disney’s Animal Kingdom (Caroline). But, we could trade or pick up open shifts at any of the four Parks, the two water parks, or any of the hotel gift shops at Disney World! Never a dull day at WDW! 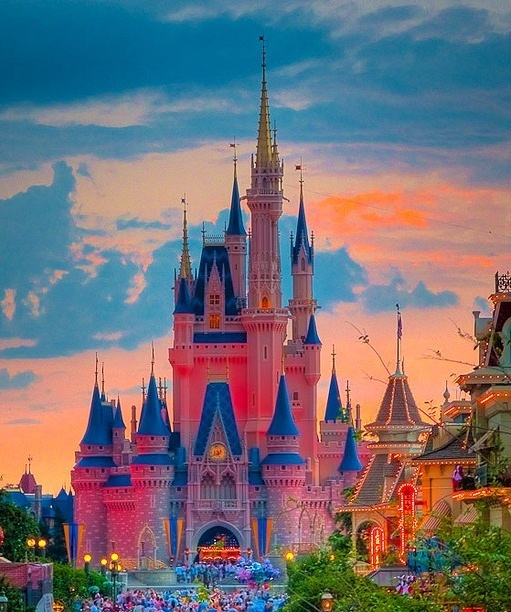 Working at Walt Disney World is a magical experience that few get to have in their lives. Unlike other jobs, you actually look forward to going to your work to play on your days off. Also, unlike other jobs, you get the special pleasure of spreading happiness to guests from all over the world. This is not to say that the job is easy. You are challenged day in and day out with guest’s high expectations. But, it has made you stronger as a person as a result. You are exposed to many different cultures that broadened your understanding of the world. You know how to say basic phrases like “how many in your party?” and “remain seated, please” in at least three different languages. You know that the most important language is non-verbal, especially when you are attempting to soothe a guest who is “critiquing” you in a language you do not understand. After you became a Disney cast member, when was the last time you waited in line for more than 30 minutes? Why would you wait when you can get in to any park for free anytime? You know when the peak crowd times are at all the parks. Doing a whole day at the parks is almost unthinkable at this point. It’s so much better to only go for a few hours, use your three FastPasses, maybe grab a quick bite to eat or Disney snack, and then go home early. Sometimes, it’s even better to go to the parks just to relax and hang out and not even go on a single ride. And, why not? Walt Disney World is your home now. You can get Mickey waffles whenever. Random morning off? Mickey waffles at the Contemporary. Mickey waffles at Grand Floridian. Resort hop to find the best locations. But y’all know that Trail’s End Restaurant is the very best breakfast buffet with the best cast member discount! Once you’ve worked for Disney long enough you have friends everywhere in the parks. It’s like in high school when you can walk around and say hi to friends as you go to class, except you’re doing it at the Magic Kingdom or Disney’s Animal Kingdom. And honestly, this is so much better! As a cast member, you find yourself spending all your money on Disney merchandise (Disney knows this…that’s why they give you a great 20% cast discount!). You can’t help yourself either because you are tortured every time you go to work seeing all the other guests with the merch you want. Like rose gold ears or the WDW sweatshirt. You didn’t even know you wanted them until they were impossible to get. Then it just felt like the guests who did have them were taunting you until you finally found them at WoD and bought them. You can tell the time at night by all the fireworks shows. 9:00pm – IllumiNations. 10:00pm – Happily Ever After. Until they went and changed the time to 7:30pm. Who does that? Don’t they know we set our evening by these time signals? Being a cast member in Orlando, Florida takes FOMO (fear of missing out anxiety) to a new level. Who cares if you’re exhausted from working a 60 hour week? You still feel guilty for staying home to sleep in on your one day off because in Orlando there are literally THOUSANDS of things you could be doing with your time. But, all you really want to do is sleep and be a normal person. As soon as you become a cast member people suddenly start contacting you for free tickets/discounts. You haven’t talked to them in almost 5 years, and suddenly you’re a Disney cast member and they just happen to reach out and want to reconnect after so long, at Disney World of course. Oh, and by the way, can you get me and my extended family in for free? Living and working at Walt Disney World is an experience that most people outside of Orlando cannot understand. It definitely has its perks, like going to Disney World for free and experiencing magical things most guests never get to see, but it also is a challenge to adapt to the “Disney” life. However, no matter how much you complain, deep down you love your job and do it for the Disney Magic you get to create every day. Caroline working at Disney’s Animal Kingdom. Congratulations on your DCP acceptance! The Spring 2017 DCP dates are generally January 10 – May 18, 2017. The Spring 2017 DCP program is almost 3 weeks shorter than the Fall 2016 DCP program. This can only mean one thing: There’s no time to waste! Shop! The 2016 Disney Family Holiday Celebration – and the 40% cast member merchandise discount – ends February 9, 2017. Shop ’till you drop! Treat yourself with a shopping trip to Cast Connections. Don’t forget your cast member coupon! Epcot’s International Festival of the Arts 2017, January 13 – February 20, 2017, Brand New Event! 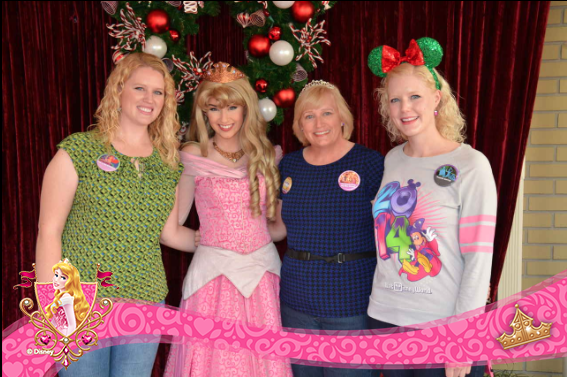 Take a photo at the Purple Wall in the Magic Kingdom and instagram it! 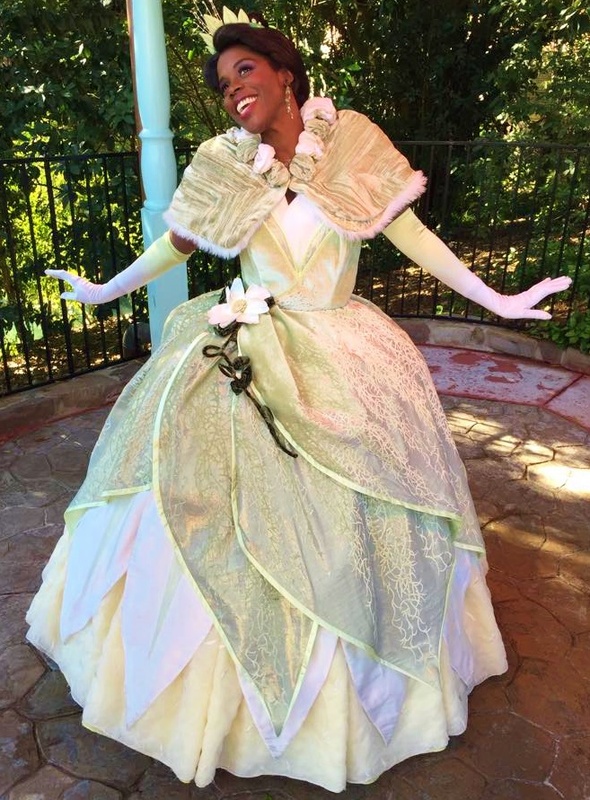 While you’re seeing Jiminy Cricket, stop by and meet the fabulous DiVine too! 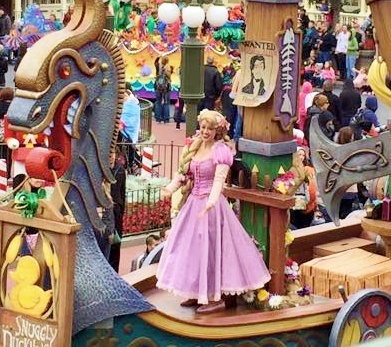 What’s left to do and see on your DCP Bucket List – 50 Must Do Things! before program end??? Welcome to magical Walt Disney World! 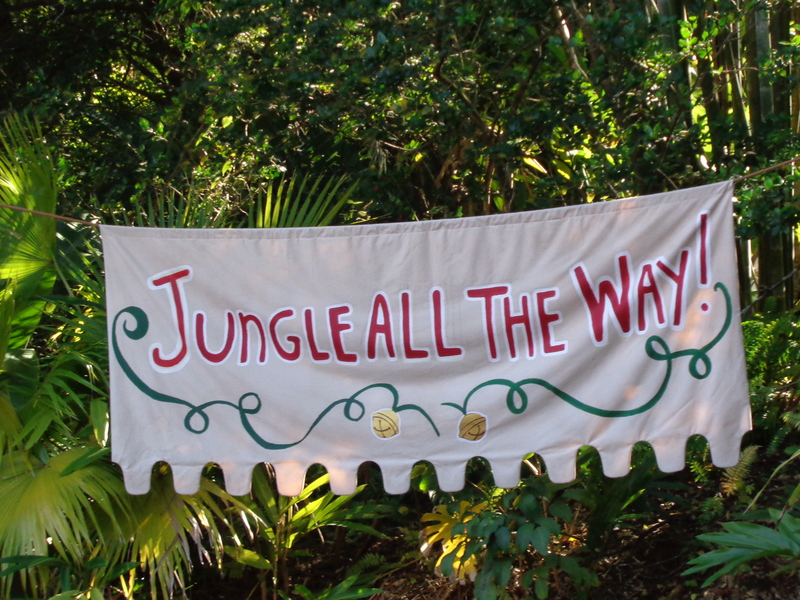 It’s backkkkk…..The Jungle Cruise in Adventureland is the Jingle Cruise for this holiday season! Welcome to the 2016 Jingle Cruise! Holiday presents under the tree for the Skippers. 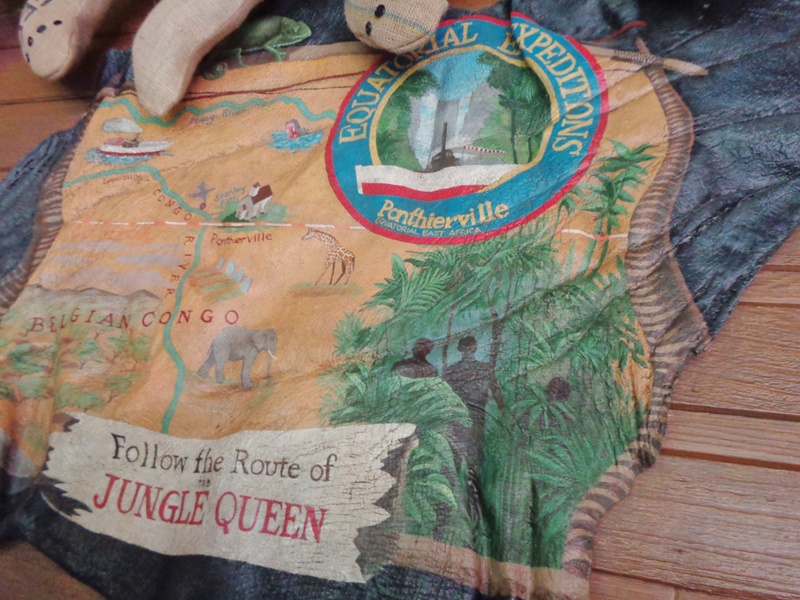 Has anyone ever noticed that the Jungle Cruise map appears to be painted on an elephant’s ear? 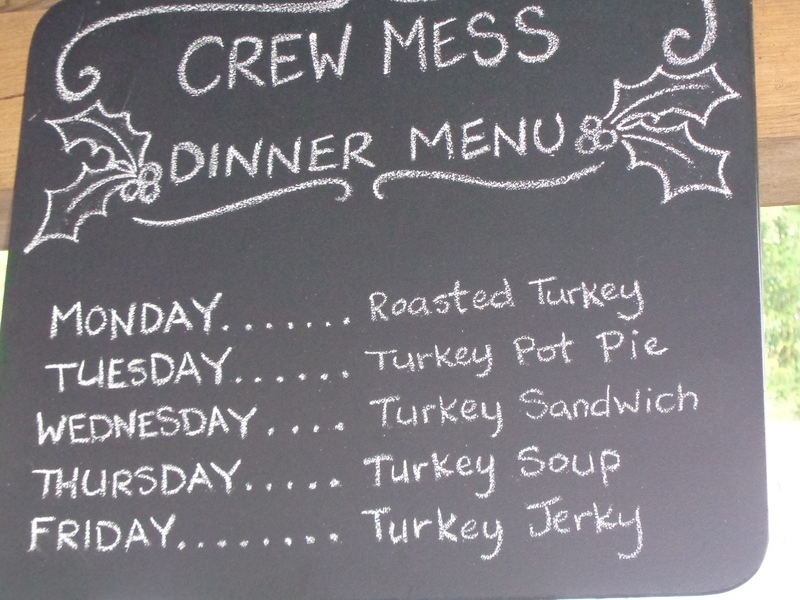 Love this ‘turkey’ menu for the week! Our holiday-themed cruise boat – with a new name – arriving at the dock. The skippers are all wearing holiday stocking caps. This year during the holiday season, your favorite Jungle Cruise experiences transform into the Jingle Cruise—a festive-yet-familiar adventure, from stem to stern! 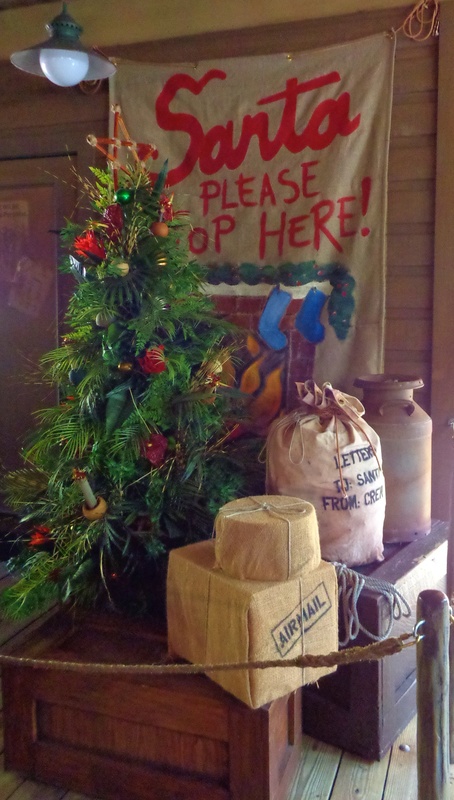 The Skippers are once again homesick for the holidays, so they’ve added holiday cheer to the Jungle Cruise queue and boathouse with decorations that have been mailed to them from home, plus a few they’ve created themselves. You’ll also see some holiday supplies that got lost in the jungle along the way! 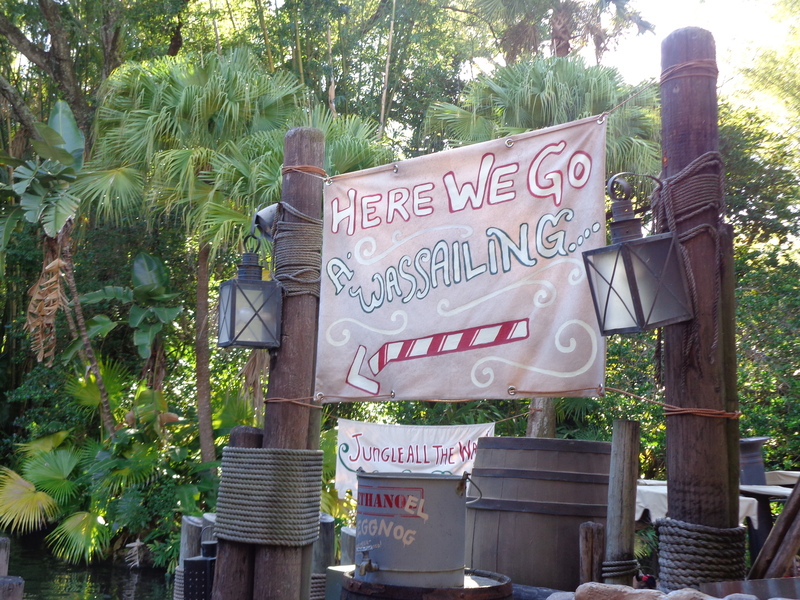 The Skippers have also added a slew of all new holiday-themed jokes to their tours that are the perfect way to get guests in the holiday spirit. 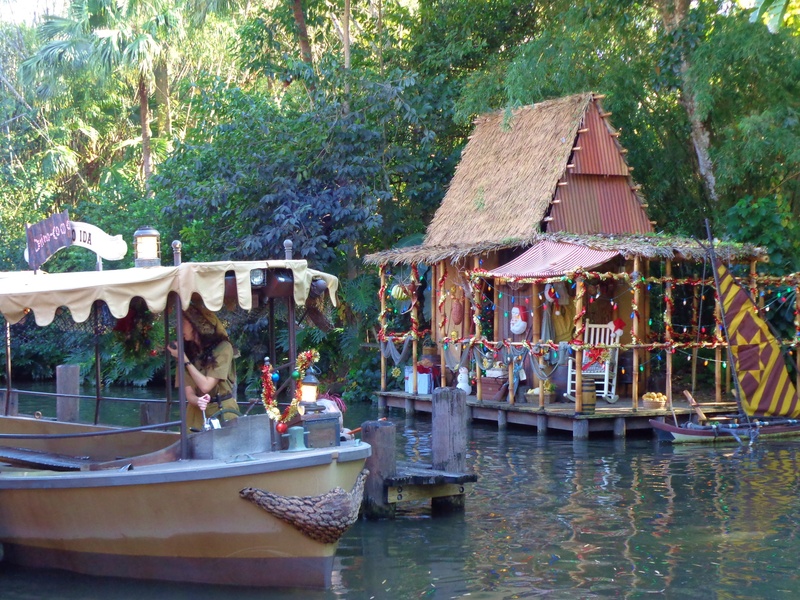 Additionally, Jungle Cruise boats have been renamed with the holidays in mind, and if guests listen carefully, they may hear a holiday-themed radio broadcast playing in the background. 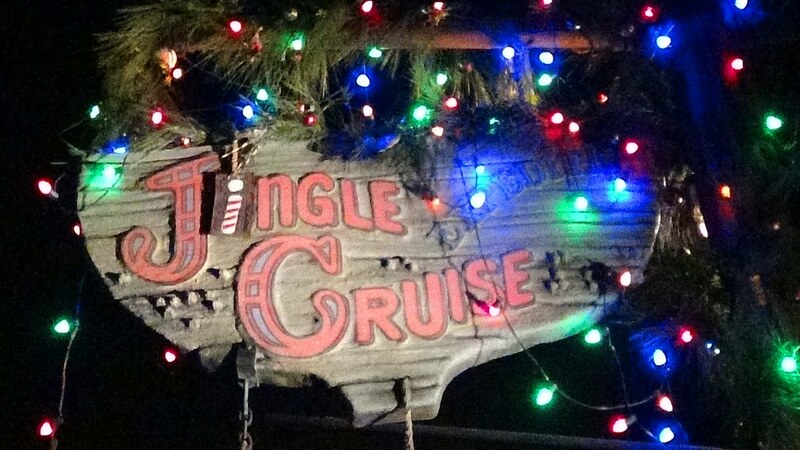 The Jingle Cruise is open during normal park hours and also during Mickey’s Very Merry Christmas Parties. The Jingle Cruise is fun at night, but we think it’s better during the day! Happy Gnu Year to you from all the Skippers! I’m wearing my new Holiday Jingle Cruise shirt! Spaceship Earth at Epcot to become Giant Star Wars Death Star! Opening December 16, 2016! Can’t wait to see it!!! On December 5, 2016, we are celebrating Star Wars at Disney’s Hollywood Studios as well as the upcoming film Rogue One: A Star Wars Story with an invite-only meet-up event that’ll feature Spaceship Earth magically transforming into the Death Star. Crazy exciting evening at Epcot! During our Star Wars celebration, Spaceship Earth will be transformed into the Death Star through digital projections. And before the Death Star appears, we will be sharing updates on current and upcoming Star Wars experiences at Disney’s Hollywood Studios upcoming in 2017! Live streaming of the event will begin Monday night at 10:25pm EST: Live Streaming Link. Guess who might be there!!?? Update: The Disney Parks Blog will be hosting a meet-up that will include local media at an after hours event at Epcot in Florida on Monday, December 5, 2016. This event opportunity is now filled. Check your email if you applied for tickets!